West Indies. Guadaloupe. Antigua. MarieGalante & c.
A fine hand colored 1815 map of the West India islands of Antigua, Guadeloupe and Marie Galante. Depicts the islands in considerable detail with attention to rivers, topography, towns and villages, and major port cities. 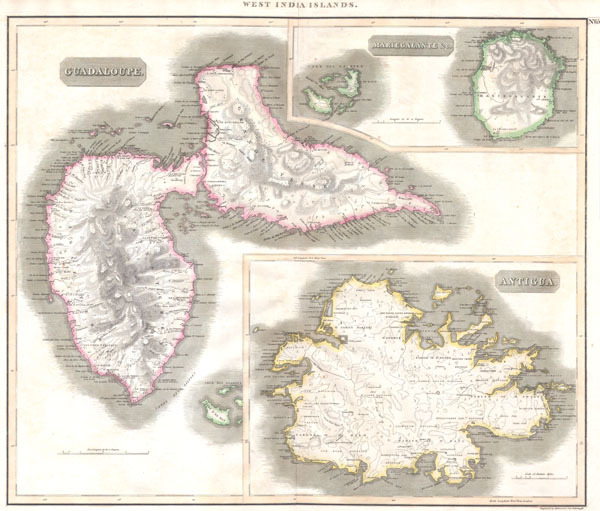 Issued as chart number 65 in the 1814-1815 printing of John Thomson's New General Atlas. Engraved by James Kirkwood of Edinburgh, Scotland..
Catalogue of maps of Hispanic America, v. 1, p. 245. Rumsey 1007.074.